Amoebas are found in soil, freshwater, and saltwater. They have no definite body shape and continually change form (amoeba is derived from the Greek word meaning “change”) as they move using their pseudopods, which are lobe-shaped projections of the amoebas’ cytoplasm. As the cytoplasm extends and fills, the amoebas move. These same pseudopods also surround and capture food in a vacuole, ingesting the particle or organism by phagocytosis, or the digestion and absorption of the organism by phagocytes. 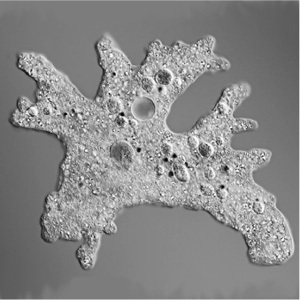 An amoeba is a single-celled animal that has no definite body shape. They move and capture food by extending pseudopods out into their surrounding environment.